Sword sales, contact us, terms & conditions, etc. Please ensure you read this page in full as it contains your cancellation rights if and when you place an order. No matter where you are in the world, we make buying hassle free (also see: packing / shipping). Please ensure that you quote the item reference numbers! We can provide you with further / full sized photos we hold on file to help you decide; all photos are Copyright and can not be used elsewhere without our explicit permission. If you want us to take additional photos, there may be a charge for this and expect a delay as all items are originally photographed, then packed, then placed into our secure humidity controlled storage facility, so taking additional photos means we have to unpack and repack the item(s). Please make sure you read our Packing & Shipping page regarding shipping costs, optional insurance, Customs, etc. Also it tells you which countries we do not ship to, and which countries we only ship to on the basis the buyer accepts all risk knowing there may be delays / other issues. Shipments within the EU / UK, to Australia, New Zealand, the USA and Canada are no problem. Selling a sword / looking to trade in? Please click here to go to our Buying page. Valuation / ID enquiries: Please visit the sword identifications & valuations page. Please note: We do not sell sword parts such as scabbards or provide sword refurbishment services (We recommend Crisp & Sons in England), sorry. We list our items for sale in GBP (£ / British Pounds Sterling) because we buy 98% of our swords in the UK in GBP, so we need to price in GBP to insure against currency fluctuations. However, we are able to convert these prices of course to € Euros and $ Dollars according to your preferences. We accept bank transfers / bank deposits, PayPal, UK cheques and Western Union only. There are no surcharges for IBAN / UK bank transfer payments. Payments by customers in the UK / Eurozone can be made in Euros instead of GBP. Not only do we avoid charges with this payment method, but so should / do you the customer. We do not have a surcharge for payments by PayPal. Due to PayPal's seller protection rules, We normally will only ship to the account holder's address on file with PayPal unless the buyer is a repeat customer. PayPal is useful if you are outside the EU, as i) PayPal charge you in your local currency, and ii) paying by International bank transfer offten attracts higher charges. Payments are to be sent "all charges paid". However, due to the fact "all charges paid" does not cover the charges we incur at our receiving bank, we have a surcharge of £6 / €7 / $9 for this payment method. Payments can be made in GBP, USD, AUD or Euros. There are no surcharges for Western Union payments. We will probably require Western Union payments in Euros however, so first the exchange rate has to be agreed. We will accept UK cheques and do not charge extra for this. We are happy to provide a lay-away service; 30% deposit (minimum), balance payable within three months please. Please note: If you do not pay the balance before time, we have the right to cancel the layaway and retain any monies paid. Please note: Once you have paid the deposit, it is not possible to switch the layaway to another item. All items sold are put into our archives marked as sold with the price removed. We also make a site wide guarantee that all items are authentic / as described. We recommend buyers simply print up the item page for their records, if this is what they need. We believe most if not all dealers who provide certificates are playing a game, because the certificates we have seen do not give money back guarantees and are therefore not worth the paper they are written on. Whereas our site does provide a money back guarantee. We view most certificates as being a vehicle to increase pricing. We do not generally provide certificates for these reasons. We can, but will need to charge you £10 per certificate. The swords we offer are in the UK or sometimes from Spain; we will inform you if an item is not currently in the UK and offer to have it returned to the UK before shipping to you if you prefer! We generally ship the following working day after payment receipt, but please be patient with us if we require an extra day, and please allow for public holidays. Europe Zone 1: Express is normally 3 working days, economy is normally 7 working days. Europe Zone 2: Express is normally 5 working days, economy is normally 9 working days. USA / Canada: UPS is normally 7 working days, regular is normally 9 to 12 working days, economy is normally 14 to 21 working days. Aussie / NZ: Normally 7 to 10 working days. All services are registered delivery. Europe Zone 1 is (Austria, Belgium, Czech Republic, Denmark, Finland, France, Germany, Greece, Holland, Hungary, Ireland, Italy, Lithuania, Luxembourg, Norway, Slovenia, Slovakia, Spain, Switzerland, Sweden). Europe Zone 2 is generally anything not inside Zone 1 excluding the Ukraine and Eastern European countries in the Russian Federation (please note: we do not ship to Russian Federation / Eastern European countries that are not in the EU). UPS delivery times; please inquire / enquire. We are sometimes asked for a discount. Generally we do not discount for new customers, though you are welcome to ask (just expect us to say "No" though and be pleasantly surprised if we say "Yes"). We do however offer a discount for repeat customers. Repeat customers receive a 10% discount on additional items up to the value of previous non-discounted orders; this means if you buy / have only bought a bayonet from us for £100 and then ask for a discount on a £1000 sword, we will only be able to offer 10% of £100. We also offer a 10% discount to serving officers of any NATO country, and also to those serving in the Australian or New Zealand armed forces. Prices quoted on this web site or sent by us by email shall remain valid for 24 hours only. Requests for purchases after said 24 hours shall be subject to revision. Prices quoted on this web site / by email may be withdrawn at any time without notice if either a) the item has been sold to someone else, or b) if there was an error in that pricing. Prices include all applicable sales taxes. All customers have the right to cancel for a full refund prior to our taking the items ordered to the shipping agent. All Internet / email customers have the right to return an item within two weeks of receipt for a full refund if the item is not as described / depicted in the photographs. EU customers have additional rights to cancel for any reason within 7 working days of receipt of the item(s) under 97/7/EC (in such cases the customer is obliged to return the item / items to us at their own cost). Any insurance element paid in the shipping cost is NOT refundable if the item / items has / have already been shipped / sent. If you wish to return an item for refund, please contact us by email first and please note; we must advise a returns number and the returns address prior to any return being sent back. We will not refund any money until we have received the item(s) back and inspected it. We will video record the opening of the package of returned items and then the item itself in one video segment in case of any damage to the item(s). The buyer is responsible returning the item(s) to us in exactly the same condition as they received them. If there is any damage, the buyer is responsible for this and therefore we recommend any returns are sent insured. Dealers, please see below. Trade / dealer sales: We do not normally get involved in trade / dealer sales, but where we do, these are clearly / obviously NOT covered by our guarantees (including authenticity guarantees) / any consumer legislation. That is, if we sell "trade" the item is as seen; the sale is final, no guarantees, no returns, no refunds. We have sold many swords around the world; we have a customer feedback page here. You can pay us by bank transfer to our bank account or by PayPal or by Western Union. Bank and PayPal accounts are not easily come by and do they do not tolerate unethical and / or poorly described transactions, so it would not pay us to act in any manner other than exemplary; Yes, we maintain our bank and PayPal accounts in good standing. We guarantee all of the items for sale here are authentic and as described when you buy from us online, except where we include doubt ("I / we think", "I / we believe", etc.). If you buy an item online (including by email) which is not as described from us, we will refund the cost including return shipping as long as the item is in the same condition as it left us; the burden of proof regarding incorrectly described items is with the customer of course. We can only accept returns for refund if notified of an issue within 4 weeks of the date of receipt by you of an item; it may take longer to return the item to us, etc. but you must make a claim within 4 weeks of the delivery of the item to your specified delivery address. If you buy / pay for an item from us and then change your mind, we may take it back and refund if you are honest about the matter; we may require a restocking fee if we do accept an item back in such a scenario. We try to include condition information in the item descriptions but you should ask specific questions and ask for specific images if in any doubt. Remember, most of the items on this site are antiques that have seen harsh use. We keep the full sized images of the photos on this site on PC's and are happy to provide these but not for re-use (if you want a photo of a sword for a web site or anything else, please be open and ask up front). Please do NOT call us asking how much we sold something for; we will not tell you unless you pay our valuation fee. If you want to know what we sold something for or have something you want to know the value of, please go to our valuations page. 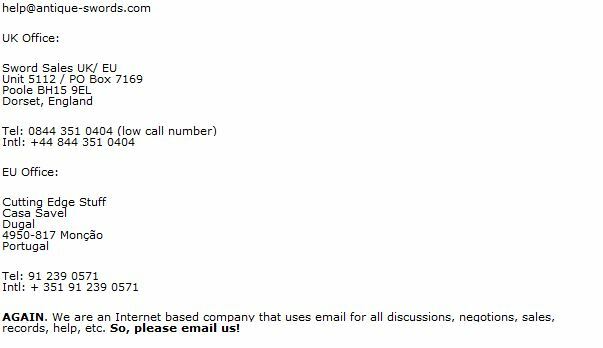 PLEASE USE EMAIL TO CONTACT US , we are a web based company and we need to keep records of what is discussed. If you we speak to you on the phone, we will probably only ask you to put your enquiry / inquiry to us in writing by email. We only have phone numbers because we are legally obliged to have these. Again, please use email to contact us. Our office hours are Mondays to Fridays 08:30 to 17:00, and Saturdays 08:30 to 13:00 (GMT/BST). No marketing / sales / survey calls / material accepted (we hang up on cold callers); all such callers / senders must email us only and we will reply IF we are interested. The buyer is responsible for ensuring they are legally able to import / receive whatever they buy from us. A good reference for this is the Universal Postal Union Restrictions By Country page; simply look for the country you are resident in and check Section XIX / Chapter 93 which covers arms under that country. We do not take any responsibility for this; we only take responsibility for (guarantee) clearing outbound UK / EU customs. Some countries allow antique / collector's edged weapons but only with a import permit; it is the buyer's responsibility to check. European Union: Shipments within the EU do not matter UNLESS the member state you are in classifies antiques weapons as literal weapons, not collector's items / antiques. The only EU state we are aware of with any issues in this respect is the Netherlands, but we will happily send items there as it is the buyer's responsibility to check. Sending goods within the EU is legally "Movement of Goods", not export / import. Many people in the UK think swords are banned there; antique and collector's swords (such as WW2 Japanese and German edged weapons) are not banned at all; only so called "Samurai" swords (cheap copies of Japanese Katanas) are banned. Of course, all countries prohibit people from carrying swords in public, but to keep at home the swords you see here are not a problem. Outside the EU: Buyers have the responsibility of checking with their domestic Customs authority to determine if the item they are interested in is permitted / requires an import permit or not. None of our items require an export license because they fall under the financial thresholds set by EC Regulation 3911/92 which governs antiques and in particular which items can be considered restricted "cultural goods".